Paring Bordeaux wine and food is as easy as it is fun. Start with this simple, but important tip. Get a Bordeaux wine you like, prepare something you enjoy eating, or pick a restaurant you’re fond of, and most importantly, find a good friend or lover to share the wine, meal and night with. In a nutshell, that is about as good a pairing with food gets. However, if you want to delve deeper into wine and food pairing, we have the top 10 best tips for matching wine with food for you on this page. People make food and wine pairing look like a science project. What fun is that? Wine is fun! So is pairing Bordeaux wine and food. There are a few suggestions that help. But generally speaking, if you like it how it tastes, it works. When visiting the Bordeaux wine region, people are often surprised how often meals with fish as the main course are paired with red Bordeaux wine. It’s healthy, light and a good match. So why not? Remember, pairing wine and food is fun. Don’t leave that part out of it. With Bordeaux wine, you have a few choices, older red wines, young red wines, older white wine, younger white Bordeaux wine and sweet wines, with or without age. The key is to decide if the wine, or the food is the star of the night. Today, food and wine pairing in the Bordeaux wine region has never been better. There are countless places offeringamazing food wine pairing experiences in Bordeaux. Once you’ve picked the wine you want to share, make sure it’s not served too warm. Red Bordeaux wine at room temperature is not as interesting as when the wine has a slight chill. The wine will feel fresher, rounder and offer a more refreshing experience, especially when paired with food. If you’re going to decant your wine, try timing it so it’s ready to be poured when you’re ready to serve. That might sound elementary, and it is. But it’s also forgotten more often than not by even the most experienced wine drinkers. Once the wine selection is out of the way, what is the right wine and food pairing for you? Keep things easy and remember what we said about there being only one star at the table, the wine, or the food. I cannot tell you how many wine dinners I’ve attended where the aromas and flavors of the food completely overwhelmed the wine experience. The natural tendency is to bring your best bottle, or purchase the best wine when you are out for an evening at one of the restaurants. I’m not sure that truly accomplishes your goal because either the food, or the wine is going to earn the spotlight. The problem with too many wine dinners is that chef’s claim, and truly desire to create menus and perfect wine and food pairings. However, what really happens far too often is, they do not understand there are times when the wine should be the star of the show. They will prepare overly complicated, rich, spicy or exotic creations that can be stunning works of art. But that detracts from the wine. There is only room for one star at the table. Is it the wine, or the food? You need to decide and allow that to happen. The top ten easy Bordeaux Wine and Food Pairing Tips. Rule #1 Pour wines you like with food you like. It does no good to order a dish you have only moderate interest in, and pair it with a wine you do not like, simply because someone said it was a perfect wine and food match. Rule #2 When in doubt, refer to rule #1. Rule #3 Decide which is the most important part of the experience for the night, the wine, or the food. Serve complicated dishes with simple wines. Open simple wines with complicated food. Both you, the wine and dish will be happier. Rule #4 Serve simple dishes with your best wines. Aged Left Bank Bordeaux, with its Cabernet Sauvignon based blend takes on beautiful aromatics with truffle, tobacco, smoke, earth, cherries and spice. That aromatic display will be lost in an overly complicated menu. Rule #5 If you prefer Right Bank, Merlot dominated Bordeaux wines, they pair with the same foods as those from the Medoc. It all goes back to serving what you like. The subtle differences in the character of each bank add some nuances. For instance you will find more chocolate, licorice and floral notes in Pomerol than Pauillac, but for all intents and purposes, they are interchangeable at the dinner table. Rule #6 Younger wines are more tannic. They are richer in flavor. They can stand up to heavier dishes and more powerful flavors than older wines, which can be stepped on, with more aggressive cooking. This is where lamb, aged beef and stews are really going to shine. Rule #7 While red wine with red meats is an easy way to look at things, it’s all about the preparation. Fish with lemon for example might not be my choice for red wine, but use mushrooms, tomato, veal stock or red wine reductions with the fish and you have a perfect wine and food pairing. #Rule #8 Wine with cheese. Wine with cheese is a perfect combination. It’s in my opinion, the perfect ending for a meal. For many wines and cheeses, white wine often makes a better pairing, due to its higher levels of acidity found in white wine. But if you prefer red wine, or red wine with cheese like I do, open a red wine and enjoy your cheese. If you’re a fan of sweet, white wine and cheese, you’re in luck, because the high sugar levels pair perfectly with the natural salty flavors of the cheese. Wine and food pairing is all about matching the wines you like with the foods you enjoy. The bottom line to pairing wine with cheese is, eat the cheese you love with the wines you enjoy. That will always create the perfect wine and cheese pairing for you, each and every time. Rule #9 Dry, white Bordeaux wine is quite versatile. White Bordeaux wine, due to its freshness and flavor profile pairs with almost any white food: shell fish, fish of all types, oysters, clams, mussels, sushi, veal, chicken, pork etc. Sauvignon Blanc and Semillon blends are fresh, refreshing and quite citrusy. Sauternes and other sweet, white Bordeaux wine pairs well with several dishes that range from sweet to savory. For example, Oysters and Sauternes is a great summer pairing. Salty cheese, lobster, chicken and of course spicy, Asian inspired dishes are perfect matches. The classic paring is of course, Foies Gras with Sauternes. With most of those pairings, personally, I prefer lighter styles of Sauternes, perhaps a vintage with a more moderate amount of sweetness or botrytis. Rule #10 Texture is worth paying attention to. Thick foods and rich wines work well together. Delicate foods make a better wine and food pairing with lighter, elegant wines. 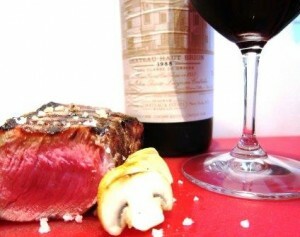 What are you opening tonight to make your Bordeaux Wine and Food Pairing for the evening?